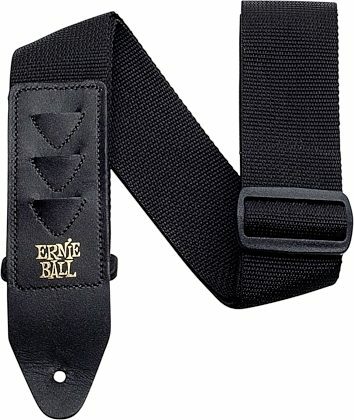 The Ernie Ball Pickholder PolyPro guitar strap is designed with an extended leather end to house up to three guitar picks, conveniently located on the lower front end of the strap. The leather ends are embroidered on comfortable 2" wide black polypropylene webbing, providing added durability and strength. Strap length is fully adjustable for short or extra-long applications.